BonBon Bombay and The Hillbilly Rockets at Le Divan Orange March 14th, 2013 with Special Guest Bloodshot Bill!!! 11pm! 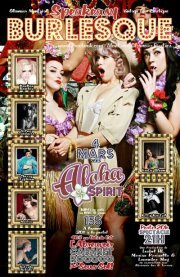 The Grand Burlesque Show March 21st-23rd at Club Soda, Montreal!! BonBon Bombay is going all out on this one! Celebrating burlesque legends and more….